Yunnan province is an important and popular tourist spot in China. Against the backdrop of scenic destinations that include Jade Dragon Snow Mountain, Lugu Lake, Shangri-La, and Xishuangbanna Prefecture, the ongoing construction of highly efficient transportation networks is a critical element for growing the province's tourism-based economy. Yunnan is set in a complex, rugged topography. With 94 percent of the land classified as mountainous or semi-mountainous, building roadways and high-speed railways is extremely costly. A new regional airport, on the other hand, requires about CNY1 billion and will provide a quicker return than any form of large-distance, ground-based transportation. For example, for an investment of USD 37 million (CNY 256 million), the construction of Diqing Airport has made Shangri-La more accessible to the world — a cost equivalent to building two or three kilometers of highways. As this shows, the development of regional aviation is significant. Ruili Airlines, the first local airline in Yunnan, officially opened in May 18, 2014. The company planned to put down roots in Yunnan, expand regionally, and eventually explore markets across Asia, Europe, and the North America. With Kunming as its hub, Ruili Airlines organized a highly profitable network of national air routes with flight times between 2 and 2.5 hours to optimize route operations. One year after launch, Ruili Airlines won the "China Excellent Flight Attendant Team" award; and by the end of October 2015, Ruili Airlines owned a fleet of 18 Boeing aircraft, completed more than 83,000 flights, and flew 156,000 hours. By 2020, at the completion of its first five-year plan, the airline expects to have expanded its fleet to more than 30 Boeing aircraft while maintaining the established level of safety and comfort. Ruili Airlines is becoming a leading, medium-sized, full-service airline with a domestic and international route network. With an ever-increasing number of business systems, Ruili Airlines needed to integrate and manage resources to effectively use (and reuse) computing, storage, and network assets for increased flexibility and automation. The airline committed to building its IT infrastructure to be stable, reliable, technically-advanced, cost saving, and flexible to enable the effective execution of business applications, operations, maintenance, and long-term growth. Generally, airlines do well in data collection, but badly in data using. Cloud computing applications can reduce the cost of storing and processing data and provide hassle-free data using for airlines. Huawei provides an end-to-end digital platform that includes the most complete cloud data center solution and rich cloud-based construction experience and service capabilities through comprehensive innovation covering chips, hardware, and software. Huawei was recognized by Ruili Airlines with its high performance, intelligence, energy saving, flexibility, security, and extensive project experience. To meet the requirements for the long-term evolution of their Information and Communication Technologies (ICT) infrastructure, the first step for Ruili Airlines was to build a private cloud platform and implement cloud-based services. A feature of the Huawei cloud data platform is support for active-active redundancy across three centers at two sites to ensure continuous and reliable data services. In the future, it is planned that the platform will be interconnected with a public cloud to provide a hybrid service system with private core data services and Internetized web services. Huawei deployed FusionServer-series servers, OceanStor-series storage systems, and the CloudFabric cloud data center network solution to build the infrastructure for Ruili Airlines' private cloud. The data center cloud platform was launched using the Huawei FusionSphere cloud operating system to achieve best-in-class resource and service sharing and on-demand use by multiple service applications. The open-source interfaces of the FusionSphere platform has allowed for the integration and reuse of legacy IBM servers with newly purchased Huawei equipment. The original IBM machines and newly added FusionServer hardware have been combined into multiple Virtual Machines (VMs) to allow for dynamic resource allocation based on real-time business requirements. OceanStor’s primary storage array was configured for virtualization and business data storage. The data center adopted a two-layer (core and access) network architecture. 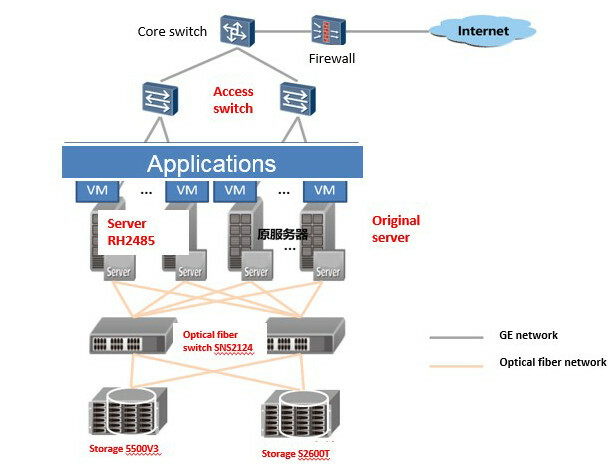 By using network virtualization technology, the core switch equipment functions at both the core and aggregation layers. The flattened architecture simplifies the network topology while improving forwarding efficiency. The virtual clusters and stacking technology of the two layers are used to prevent network loops and enhance network reliability. Huawei provided an end-to-end solution that included consultation, planning, hardware, software, project implementation, and maintenance services to support the digital platform for Ruili Airlines. The IBM servers on the original network were connected to Huawei's virtualization platform, and services on the live network were migrated to Physical to Virtual (P2V) machines. The Huawei cloud data center solution helped Ruili Airlines build an advanced private cloud that has reduced the rollout time for new services by 50 percent. In addition, reuse and on-demand use of existing resources satisfies the long-term digital platform requirements of Ruili Airlines. 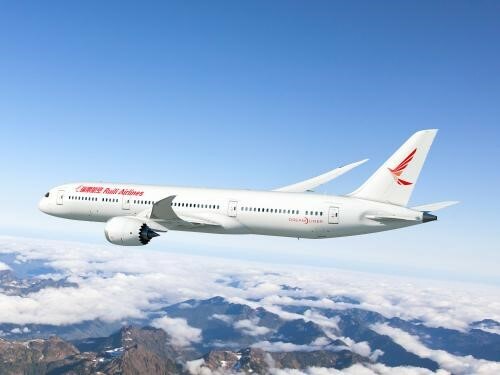 The cloud computing applications operating under the management of Ruili Airlines are being used to recommend value-added services and packaged products to its customers based on individual purchase records and related big data, thereby increasing revenue and enhancing passenger loyalty. Mobile phone and tablet APPs can monitor passenger locations and provide personalized experiences based on the surrounding environments, including VIP rooms and onboard Wi-Fi for better passenger experiences. Rich cloud applications now allow Ruili Airlines to fulfill complex resource allocations at lower costs, so that passengers and employees using mobile devices can enjoy a growing variety of high-quality services. For example, a passenger can use a smart phone to browse discounted products in real time, check-in online, or schedule VIP drop-off and pick-up services. On November 13, 2018, Ruili Airlines had its 10 millionth passenger passing through. For many years to come, the Huawei cloud data platform is expected help Ruili Airlines to serve more passengers by supporting the continuous improvement of the ticket booking and passenger experience.